LISTENED TO TODAY: 9. TOTAL LISTENED TO 5 DAYS- 36 DIFFERENT ALBUMS. 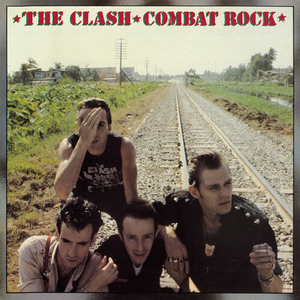 THE CLASH: COMBAT ROCK: 1982. 4 STARS OUT OF 5 STARS. The final Clash album, their biggest seller but my least listened to album by one of my favorite bands. I saw them in concert on the tour for this album. August 1982, one night I saw Elvis Costello, the next night at the same venue I saw The Clash. It will never get any better than that. BOOKER T AND THE MGS: MCLEMORE AVENUE: 4 STARS OUT OF 5 STARS. Booker T and The MG’s- doing instrumental versions of The Beatles “Abbey Road.” Saw them a couple times in the 1990s backing up Neil Young on a tour. Great musicians. U2- SONGS OF INNOCENCE: 2015. 4 STARS OUT OF 5 STARS. Better than a lot of people will acknowledge. The most owned U2 album thanks to their giving it away free on ITunes. Still waiting for the follow up “Songs of Experience” which was supposedly done 2 1/2 years ago. Going to see U2 twice this summer on their 30th anniversary of The Joshua Tree Tour. CROWDED HOUSE: INTRIGUER: 2010. 3 STARS OUT OF 5 STARS. Crowded House has only released six studio albums over the years and this is their latest and my least favorite one. Saw them in Buffalo on their tour for this album and they were great. Will there ever be another CH album? THE JIM CARROLL BAND: CATHOLIC BOY: 1980: 4 STARS OUT OF 5 STARS. Poet, author Jim Carroll’s first album with the classic “People Who Died.” Surprisingly good. He recorded a few more albums but none of them matched the power of the debut. CAROLE KING: TAPESTRY: 1970. 5 STARS OUT OF 5 STARS. Massive hit from 1971, spent 15 weeks at #1 and nearly six years on the charts, sold 25 million world wide. Landmark album of the early 70’s singer-songwriters era. At the time she had been around forever as a songwriter but wasn’t even thirty yet. MILES DAVIS: KEN BURNS JAZZ: 2000. 5 STARS OUT OF 5 STARS. Back in 2000 when Burns came out with his Jazz series on PBS there were oodles of cd’s on jazz also released to go with the series. This is one of those one disc samplings of songs by individual artists. CHARLES MINGUS: KEN BURNS JAZZ: 2000. 5 STARS OUT OF 5 STARS. Another of the Ken Burns series Cd’s. ← MY LIFE THROUGH MY T-SHIRT COLLECTION- CHE!